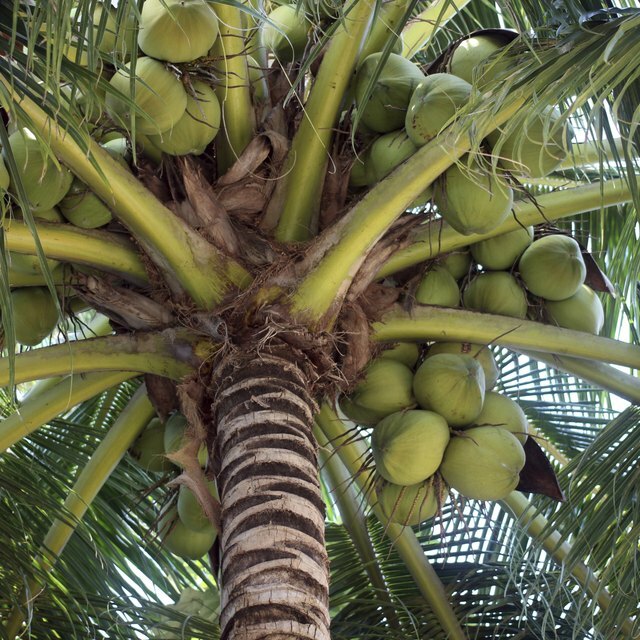 The fruit of the coconut tree provides fabulous, hair-growing properties. 1 What Does Coconut Oil Do for the Body? Growing long, luxurious hair is a common goal of many people, both male and female. Researchers have examined several natural methods and ingredients as potential tickets to long, beautiful hair. Some have touted coconut oil to be one of the natural ways to promote hair growth, as it has been used since humans began inhabiting the tropics, where the fruit grows. Thanks to the numerous proteins it contains, coconut oil helps keep the scalp healthy, promotes healthy hair and growth, and improves the condition of damaged hair. Coconut oil is frequently used in dandruff relief creams and hair conditioners as a means to help prevent hair breakage and loss. Coconut oil can do this alone if applied topically to the hair or scalp. Coconut oil can also be used as a pre-shampoo conditioning treatment. This will protect the hair from being stripped of its natural oils during the shampooing process. According to a study in the National Institutes of Health's U.S. National Library of Medicine, of the three most commonly used oils in the hair care industry (coconut, sunflower and mineral), coconut oil was found to be the only one capable of greatly reducing the amount of protein loss from hair when used pre-shampoo and post-shampoo. Coconut oil is a great moisturizer, which is key to hair growth. The moisturizing properties of coconut oil help to keep the hair shaft strong, therefore lessening the chances of breakage and damage so hair can grow longer. Coconut oil also locks onto the weaker parts of hair and strengthens the area, decreasing the chances of breakage. Breakage can impede the hair-growing process. If you have dry hair, coconut oil can be used as the perfect daily moisturizer. Simply put a small amount in the palms of your hands, rub together and apply to hair strands to keep hair moisturized between shampoos and conditioning treatments. Several beauty websites like Essentious.com and Healthy-Oil-Planet.com recommend using organic, virgin coconut oil for best results. The scalp’s sebaceous glands produce an oily secretion called sebum, which keeps the scalp from cracking—much like lotion does for the skin on the rest of your body. Sebum also waterproofs hair and protects it from damage. Both coconut oil and sebum contain medium-chain triglycerides, which allow the substances to effectively penetrate the hair shaft so their beneficial characteristics can assist in maintaining hair’s health and increasing growth. Because coconut oil shares many of the same qualities as sebum, it is highly effective when used on the scalp. Not only can coconut oil keep the scalp nice and moisturized, but the oil also can keep it clear of bacteria and fungus. Coconut oil has anti-parasitic properties as well, which makes it an effective way to keep lice at bay. The oil can ease the pain or irritation of a scalp bump, pimple or mosquito bite as well. Keeping the scalp clean and clear of irritants like lice and bacteria is key to promoting hair growth. Be sure to wash your hair on a regular basis if you use coconut oil for hair growth. If you don’t, the hair follicles in your scalp will become clogged by the oil, which will prevent hair growth. When it comes to baldness, Coconut-Oil-Central.com reports that the fruit's oil has been found to be effective in stopping hair from falling out and, in some cases, can cause hair to regrow on parts of the scalp that stopped producing hair. Aricka Flowers is a writer in Chicago. She has written health stories for "Chicago Life," "Health Care News" and ReachMD XM Radio XM 233. Flowers earned a master's degree from the Medill School of Journalism at Northwestern University and has a bachelor's degree in journalism from the University of Illinois at Urbana-Champaign.